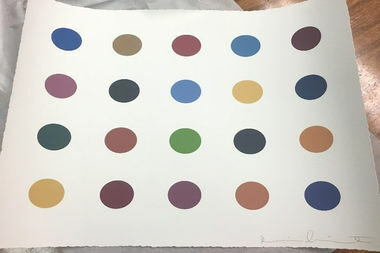 One of many faked Damien Hirst prints created by Vincent Lopreto. MANHATTAN — An ex-con with a long history of faking work by famous artist Damien Hirst was hauled back to New York to face justice after getting caught in New Orleans last week, prosecutors said. Vincent Lopreto, 52, was arrested about 10:30 a.m. in the French Quarter, after authorities hunted him down from New York, according to The Times-Picayune. He was arraigned in front of Manhattan Supreme Court Judge Melissa Jackson on Monday on indictment charges of grand larceny and scheme to defraud and faces up to 20 years behind bars if convicted, prosecutors said. Assistant DIstrict Attorney Jaime Hickey-Mendoza said investigators tracked Lopreto down to New Orleans and arrested him there after a sting in which undercover officers in New York bought two bogus prints that he purported to be Damien Hirst originals. They added that he has two felony convictions for selling fake Hirst prints he claimed to be real. According to state Department of Corrections records, Lopreto was behind bars at Woodbourne, NY from May 19, 2014 until Oct. 5, 2015. But he was back at it within weeks of his release, prosecutors said, selling a bogus Hirst painting on Oct. 20, 2015. He kept going with the scam until as recently as Feb. 2017, prosecutors said. They added that he used aliases to market the bogus artwork for between $3,000 — $14,000 apiece — for a total of $400,000 — to unsuspecting buyers in New York and around the world. Judge Jackson ordered him held without bail. Lopreto's lawyer, Sol Schwartzberg, told a judge that Lopreto's parole history was not relevant to the case. He declined to speak to reporters outside the courtroom. Federal authorities arrested Lopreto and his business partner in 2014 for fake print's of Hurst's "Valium" for $2,000 on eBay, reports said. Both pleaded guilty to identity theft and fraud, reports said. In 2009, Lopreto was arrested for again for making fake Hirst pieces, according to reports. Hirst, who's from England, is best known for his piece "The Physical Impossibility of Death in the Mind of Someone Living" in which he encased a shark in formaldehyde and silicone.